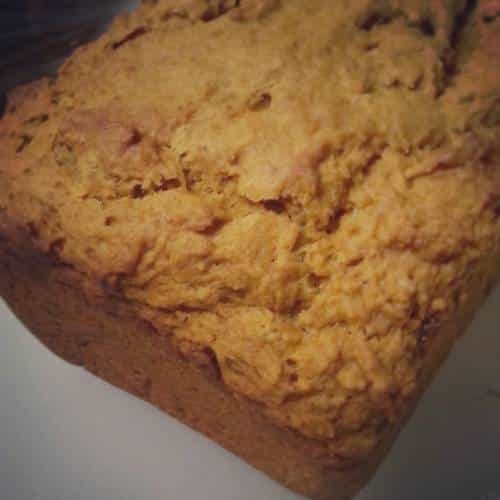 Fall is just a good excuse to eat pumpkin bread. Besides the fact that pumpkin is really good for you, and pumpkin bread is a favorite for Thanksgiving dinner! In a large bowl, blend sugar, pumpkin, oil, vanilla, and water. Add flour, baking powder, cinnamon, salt, ground cloves, and fruit fresh (optional) to bowl with wet ingredients. Blend. Spray a bread pan with non-stick spray. Pour the mixture into the pan and bake for 50 minutes or until cooked through (place a knife into the center of the bread and if it comes out clean, it is cooked through, if not bake for 5 more minutes and test again).